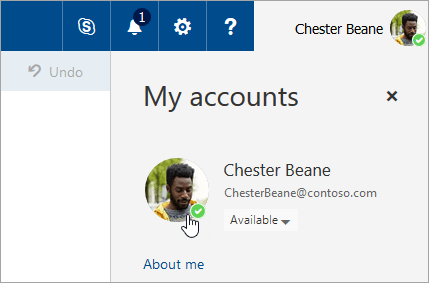 You can change your photo and account information in Outlook on the web by clicking on your name or profile picture at the top of the page. 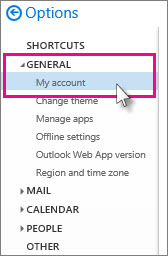 To change your photo in Outlook.com, see Change your photo in Outlook.com. Select your photo at the top of the toolbar. Select the camera icon next to your photo (above your name). In the Change photo box, select Upload a new photo. Choose a photo to upload and select Save. Your new photo will appear the next time you sign in to Office 365. At the top of the page, select your name or profile picture, and then select your profile picture under My accounts. In the Change Photo dialog, select Browse and choose the picture you want to use. At the top of the page, select Settings >Mail. Under Options, select General >My account. Under My account, enter the information about yourself in the boxes. Note: You can also change your photo here by selecting Change photo on the picture box, selecting Upload photo, choosing a picture, and selecting Save.